A bit of self promotion here, but I’ve recently had a few television appearances, those being The Victoria Derbyshire programme on Tuesday, RT News the week before and Sky News tomorrow morning. Some might criticise me for doing these interviews, but it’s important to get the news out there. People need to know exactly how bad it is don’t they. By the way I don’t get paid for any of this either. Today was cold, below zero and we had to leave half an hour early because of this. Self care is very important as I learnt in August when I was hospitalised, and I apologise for leaving early. I’ll use pseudo names as usual, it was very busy today and we spoke to lots of people, handed out much needed food parcels and helped lots of people. Everyone that required help was given help, no one was left without it. Cathy is a single parent with a young child, she claims universal credit and started a new job a few months ago. She was happy because she thought that it would be a way out of poverty. She’s since learnt that it doesn’t. Cathy was given a different tax code, and as a result most of her wages were taken away by her huge tax bill every month. Her employer took pity on her and gave her an advance of her wages because she needed to eat, pay childcare and suchlike. Because the universal credit system saw this as being two wages in one month, they stopped her universal credit top up payments. She’s shown them all of the evidence that would rectify this but the DWP are at the moment refusing to change their minds. So payslips, evidence from the tax office, proof from her employer have all been refused. They refuse to budge on this, they refuse to even look at the evidence. Cathy has now had her tax code changed, but she won’t see the benefit of this until next month. The advance payment that was given to her had to be paid back out of her wages. She’s now left with £101 for the month to live on, remember she also has a small child, has to feed and clothe her child, get to and from work and keep her home warm. I referred Cathy to our local MPs office, I’m sure that they will help her to rectify this but the plain refusal of the DWP to even look at her evidence is clearly wrong and is also extremely bad practice. Do they care? Not one bit, they don’t care if they both become hungry, homeless and suchlike. Everyone should be horrified by their attitude towards claimants. Ben stopped me outside the Jobcentre, he asked me if I’d watch his bicycle for him whilst he attended his appointment, he can’t afford a lock for his bike. Of course I said yes, we do this a lot and have most likely prevented a fair few bikes from being stolen. Ben told me that he was sick and tired of universal credit, he’s having a tough time and even after budgeting he can’t manage. Advance loans have to be paid back, rent and other debts have to be paid and it’s leaving him unable to support himself. 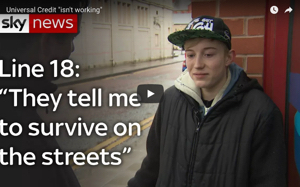 I handed him a leaflet and he told me that he doesn’t receive his next payment until the 9th of February, he’s got no food and no money to buy any either. He told me that he’d asked for a budgeting loan but had been refused. Basically tough, we’re not going to help you even though we got you into this mess in the first place. As I handed him a food parcel, he couldn’t believe that a stranger would help him, care for him and listen to his plight, you see you don’t normally associate kindness with the Jobcentre. I pointed out to him that this is the very reason why we stand outside and why we aren’t allowed in on Thursdays even of someone needs our help. He couldn’t thank us enough. It was then that I spotted Janet walking out of the Jobcentre. She looked both upset and annoyed, so I handed her a leaflet and asked her if I could help her. She told me that she didn’t need it because she was going to have to stop her claim for universal credit. I asked her why and she replied that her advisor had advised her to. As you can imagine I was rather surprised at this because she hadn’t found a job, she was struggling to live on £250 a month to feed both herself and her children, so I asked her a few more questions. Janet had attended her appointment and had told her advisor that she was struggling to survive on such a low amount of money, she also told them that she had worked all her life but had suffered a nervous breakdown after the death of a family member, Her doctor advised her to stop work and to rest, only the DWP appear to know better than a qualified medical practitioner. The response from her advisor was staggeringly awful. If you don’t like it, stop claiming universal credit and survive without it. She had almost literally taken this advice literally, the stress of universal credit is crippling her she told me, and she can’t afford to eat on a regular basis. Their answer was basically tough, we don’t care and we aren’t going to help you either. I spoke to an older man who had worked as a chef for around forty years. Due to ill health and disability he had to stop working and made a claim for universal credit. Since making his claim he’s struggled, he hasn’t a clue how to use a computer and can’t keep up with the demands that the DWP make of him. I advised him as best as I could and he walked away with a bit more hope than he arrived with, he told me that universal credit should be scrapped because its awful and people like him just can’t navigate the system. I then met Bill. Bill is 62 years old, has several health problems and is disabled as a result. He was claiming ESA but had failed his medical assessment so was now appealing this with the help of a local MP. Luckily Bill has a good friend that can take him to the Jobcentre for his appointments, put him in touch with his MP and basically help him fight his corner. He realises that he’s lucky in this respect because thousands of people don’t have any type of support network at all and are left without any help. I’m positive that Bill will be receiving good advice from his MP, but he really shouldn’t have to go through this should he. The DWP have a remit from the government that they must fulfil, that remit being to get people off benefits by any means possible. Today’s conversations definitely show evidence of this. Remember the DWP machine has no compassion towards anyone, it fails to recognise a persons individual requirements and needs. Universal credit is designed to fail everyone, and to make claiming a benefit so hard that it prevents you from claiming in the first place. Remember this. A massive thanks to everyone that reads and shares my blog. Also a massive thank you to everyone that also support my blog. I’m a skint single parent trying my best to help people that are forced into an in tolerable situation. There’s a donate button at the top and side of my blog. Thank you! It’s always hard work reading these accounts, but your strength in continuing this work is simply humbling. I have asked our party canvassing team, who go door to door to keep emergency food parcels in the car, because I know that sooner or later they will save a life. Would love to see an article that states that the people working within the DWP, and these review companies, have all been sanctioned for lack of compassion. “They didn’t meet the required point allocation in caring and having a heart.” and so their wages get slashed to a pittance. They can obviously dispute this…with the same time frame as a dispute through the current system, that would be fair, yes? Sounds quite ridiculous… Almost as ridiculous as a standard sanction letter from the DWP. There is a way that all this could end pretty quickly and that would be that the PCS, the union that represents JCP+ advisors discovered its conscience and started to act, not just in the best interests of their staff, but also in the best interests of society. The very fact that it is known that JCP+ staff suffer stress and anxiety at having to issue sanction referrals, (and they comply because someone else issues that actual sanction- if they were tasked with doing it to someone they see face to face they’d suffer a lot more stress) means they, the staff, know what they are doing is just plain wrong. They are afraid of losing their jobs and fear, (with good reason) that their useless union won’t back them. The PCS sits on its hands hiding behind Thatcher era anti-union legislation for no doing anything. Any half decent union would easily be able to think their way around these laws. But like far too many others, it would seem that the PCS leadership have bought into the scrounger rhetoric peddled by the Tory press. The Labour Party hasn’t exactly covered itself in praise either, having abstained in a crucial vote that could have made Universal Credit unviable. Too concerned with worrying about headlines in the Tory press to take a determined and principled stance against what the Tories are doing to society, Labour are, far from being an opposition, complicit in this Pogrom Against the Poor. The ‘do-gooder’ Third Sector needs to get real too, and stop its constant bleating about ‘flaws’ contained within Universal Credit, These are NOT flaws, but integral parts of a coherent policy to create a desperate underclass that can be exploited, more or less as slaves. Don’t believe the ‘teething troubles’ of Universal Credit. I don’t believe they are deliberate, as such, or not consciously so, (who knows with a Tory?) but they were predictable. Don’t for a moment think that the DWP couldn’t have worked out a far better, smoother implementation, after all they seem to have sewn up the conditionality rules neatly enough,so that they are pretty much watertight, and no apparent issues in the functionality there: the DWP seems to have no problems issuing sanctions! So, if the DWP had no problems sorting out the conditionality, why do they have so many ‘problems’ with the rest of it? Go figure! Anyone with anything approaching a conscience should oppose Universal Credit, however, it’s depressing in the extreme to read the comments to articles about Universal Credit on online news sites – the nastiness and virtriol towards claimants is scary. Even worse, I have suspicions that many making those kinds of comments will be forced to eat their words before too long, as there seems to be a widespread ignorance still as to the eventual remit of Universal Credit. It’s already about to start to affect the largest section of benefit claimants, state pensioners, (many of whom live in a blissful la la land where their state pension is a ‘right’ and not a benefit; so was Unemployment Benefit, Supplementary Benefit, once upon a time…). However, I’m not going to be one to experience schadenfreude. I’m quite happy to help anyone who ‘sees the light’ over what is happening, whether they be JCP+ advisors who want an anonymous way of publicising the inner workings of JCP+ and the DWP, people who have previously said or posted hate directed towards claimants, but who now find themselves in trouble with Universal Credit… The list goes on. I was moved from a house to a bungalow on advice of social services as they felt the stairs and rat problem the landlord wouldn’t deal with was seriously impacting on my already numerous acute and chronic medical issues. I was on esa support, sdp and lwc with pip, housing benefit and council tax relief. I was given a 1 bed bungalow which should have been a positive move to give me a better quality of life. Before accepting the bungalow I checked with dwp, 2 and half hours on hold, gave him my nat ins number and asked what would happen if I accepted bungalow. Was reassured when he told me that I would stay on esa and only claim housing element of uc, I said it was income related as I am long term disabled. Just before moving, I went with witness to jobcentre just to check. Again, staff assured me I would stay on esa and claim housing element uc. Just change address with esa, which I did. Eventually moved 22nd December although still liable for old house until 28th December, I had also been having to pay rent on bungalow from 5th december out of my esa. Put off claiming uc until 4th January and was again told it would be just housing element. Had uc staff do home visit on 21st January and he also said it was just housing element. 22nd January phone call from work coach who wasn’t surprised I knew nothing about appointment but said I had the worst medical history he had seen and all appointments would be by phone and not expected to find work and no sanctions. He then told me all jobcentres and dwp were wrong and I had full uc! They will take £600 month off me. I have never been suicidal in all my 59yrs but I can not feed and medicate my aid dog, pay for all the necessary non nhs funded medications I rely on and after fighting so hard to stay alive the last few years, am knowing that a quick end for my aid dog and my self is better than watching him freeze and starve and he, me. I was told within a month of uc application you can get decision reversed. 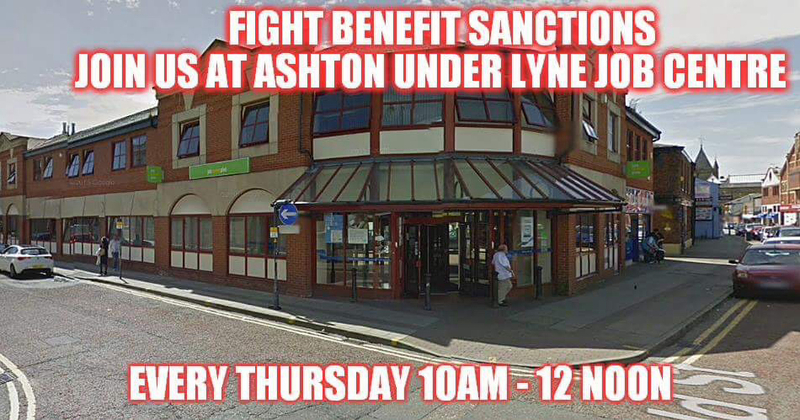 Went to customer 1st, they contacted a friend in jobcentre and said yes they would do that, sent to jobcentre to meet this friend of customer 1st.4 hours we were there and eventually this man and his friend, the Halifax jobcentre boss, Marcus, congratulated me and said they had reversed the decision as uc live services had told me it was a mistake, I should not have been put on uc in 1st place. He then rang esa and spoke to them to reinstate my esa, told me to go to council office and reapply for housing benefit. 1st time all week I could stop crying, feeling suicidal, put heating on and ate a meal and took my injection. Next day went and reapplied for housing benefit and council tax relief. Marcus had told me to close my uc ac down in my journal which I did. Got home to a phone call from marcus, quite bullying attitude, because I had made a complaint to dwp, prior to seeing him about all the lies/misadvice. He said I had to reopen my uc claim from 4th January or I will get nothing! Went in yesterday, again with witness to basically be bullied, lied to and told there is no such thing as a reversal of decision to put me on uc and monday was a total farce at best, outright lies at worst . I was in such a state that as my friend went out to car to check on my aid dog , he broke away from her, forced his way through jc doors , past security and threw himself at me alerting I was in a dangerous state. I have refused to reopen my 4th January claim as I couldnt live on it anyways and the horrific discrimination because I am long term disabled is Totally disgusting I would make a new claim as my journal says I should but marcus not only refuses to do that but has cut off my esa, housing benefit and anything else. I now have nil income and will die because of lies, deceipt and incompetence at the hands of the dwp and jc. I complained to dwp and a woman phoned me to suggest that I saw my dr because they dont want another suicide! I was so much better off in a rat infested house that I couldn’t get upstairs to go to toilet and had to sleep in a chair downstairs. Having fought so hard for the last few years to stay alive, they have managed to finish me. I cant afford a lawyer so thats it! Please continue to help the children, you do such a good job. You made me cry, I can’t believe what you have gone through. I need to move to a bungalow but I’m too scared. After reading your story , I will have to stay where I am indefinitely . It looks like the employer had made a mistake here in taking too much tax. Her employer needs to contact HMRC/DWP and explain their mistake has caused hardship. Universal Credit has always been about just one thing, forcing people off benefits and into low-pay, zero-hours work instead. Hardship and misery were always to be expected.